If you have never done any video work before it may seem intimidating at first but you will find it easier than you think if you work through the following steps. Seek help if you get stuck (Google is often a quick solution). Write this down, keep referring to it and don’t be afraid of modifying it as you go through the whole process. Don’t try to create something too complicated. Start with simple ideas and gather limited material at the beginning until you are confident that you can add more. Have a look at other video essays to see examples of good practice. Remember not to go overboard at the beginning as it is easy to download multiple files. Think about what you need to start the project and add more later. 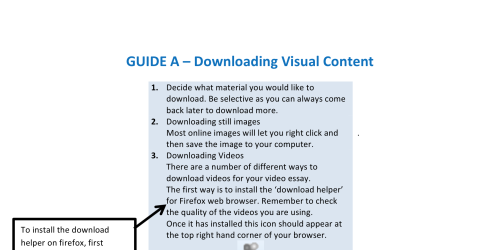 Consider ripping DVDs (note copyright, Fair Use and Fair Dealing guidelines below). This can be a tricky area, particularly as some DVDs with greater level of encryption might be harder to rip than others. If you are not confident in this area stick to the other options for gathering material. Try to cut down ripped files into sections that you will need. If not you will be working with very big files that may overload your editing software. Screen grab/screen shot still images. If you can play a film on your computer then you can grab still images from it. On a PC. Press PrtScn and then find somewhere you want to paste the image (ie. image editing software). Press Ctrl+V. If you have captured the whole computer screen you may need to crop the image. On a Mac. Press Command+Shift+3. This will save the image to your desktop. If you have captured the whole computer screen you may need to crop the image. Consider creating a voice-over file. 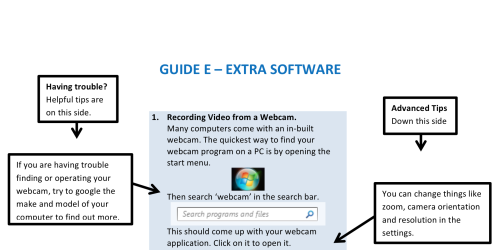 If you don’t have a microphone available, look at your phones and your computer to see if they have a voice/sound recording option. Think about who will provide the voice. Make sure whoever does so is comfortable with their voice being used in this way. One DIY solution is to use your phone to film material when it plays on a TV or other device. This will create low quality images but is an option if all else fails. Keep an eye on the quality of the visual material you are working with. When working in groups decide who is gathering what material and make sure this workload is distributed evenly. Some of this material will take up a lot of space. 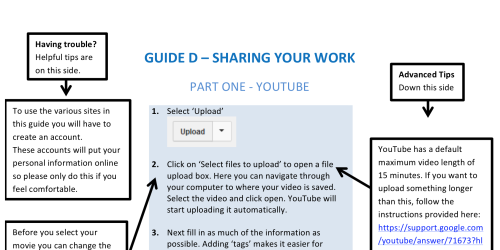 Make sure you have designated folders available, that you label your material carefully so you know what it is and that you have a plan for backing-up this work. 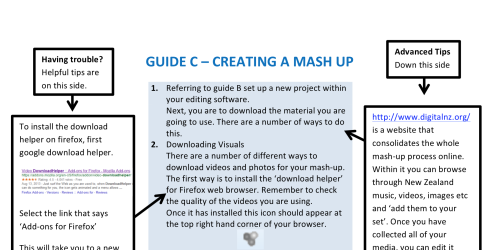 Look at the info in Guide B for how to use free editing software. If you have not used this editing software before, familiarise yourself with it and do a short practice run. 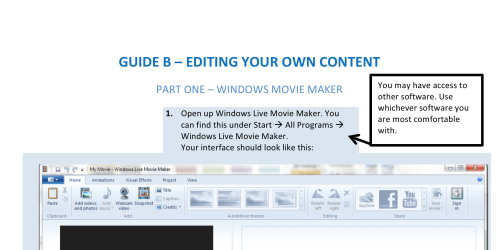 If you are familiar with other editing software you can use it. Feel free to experiment with split screens, diagrams and text but don’t over do it. If you are including a voice over you will need to decide if you do the voice over first and edit the visual material to match the voice over or if you organise the visual material first and then create a voice-over to match it. Neither way is better than the other and there will be some to and fro between the two options. If this is an academic piece that will be assessed in an academic context aim for a formal rather than colloquial/funny style. Return to your original argument. Have you made a clear and obvious argument in the video essay? Test playback. Check the video will play okay on different computers/television screens. The above and linked to information, where it pertains to the use of copyright material, is shared under the understanding that Fair Use or Fair Dealing legal exceptions are generally established—for educational, critical and private research purposes—in many, if not all, national jurisdictions. These exceptions have also been supported and successfully defended by a number of prominent professional academic associations including the Society for Cinema and Media Studies. Readers or users of this information will need to ensure for themselves that they obey the laws of the legal territories in which they live. Neither the authors nor REFRAME, University of Sussex, will accept any liability for actions readers or users freely choose to take. The authors and copyright holders of the above text and linked PDFs—Greer Fyfe and Miriam Ross—have shared their work under a Creative Commons Attribution-ShareAlike licence. CC BY-SA. February 2015. Miriam Ross is Senior Lecturer in the Film Programme at Victoria University of Wellington. She is the author of South American Cinematic Culture: Policy, Production, Distribution and Exhibition (2010) and 3D Cinema: Optical Illusions and Tactile Experiences (2015). Greer Fyfe is a Research Assistant at Victoria University of Wellington. Copyright © 2019 The Audiovisual Essay and Individual Authors.